⬅ The Thingonomicon Proofs Are Here! A few weeks after his last foray across Hard Bay to Greystone’s tumbled ruins the dwarven warrior Thangrimm sat drinking in the Scythe—a backstreet drinking den famed for its musical entertainments in the Low City— with Johann Firehammer a new friend recently arrived in Languard. Although deep in their cups, the two dwarves overheard another band of adventurers plotting their exploration of a hitherto unknown sepulchre beneath the ruined temple of Conn in the village’s dreary ruins. The other party had been engaged by Nuluani Sehiateir—an ambitious half-elven priestess at the Father’s Hall—to uncover the sepulchre and recover any remains or holy relics lying within. As luck would have it, Thangrimm knew of the lost sepulchre as the dwarf and his companions had discovered its entrance on their first foray into the ruins. The two quickly finished their drinks and returned to the Orc’s Head to tell their companions of the conversation they’d overheard. After a quick conversation—and more drinks—the party resolved to steal a march on the other adventurers (who had to wait for one of their number to finish some important spell research before they could search for the sepulchre). The next day, the party made their way to the Father’s Hall—an immense cathedral dominating the city skyline. Eventually, after dealing with a petty, officious minor priest—the party met Nuluani Sehiateir and explained they could carry out the quest quicker than their rivals. Nuluani—worried the various relics could fall into the wrong hands—agreed to reward the party with future spellcasting services if they returned any recovered relics or remains to her at the Father’s Hall. The heroes spent the balance of the day hurriedly preparing for their adventure which included once again securing the services of Taneli the brave fisherman who had previously transported them across Hard Bay’s treacherous waters and Barlon, a guard for the boat. Later that day, as they sat resting in the Orc’s Head a writ arrived from Nuluani Sehiateir obviating them of any requirement to pay taxes due on the relics they recovered from Greystone’s ruined church. The next morning, the group of neophyte heroes shivering in the chill spring air on a rickety dock in the Fishshambles was slightly different to that which had gathered here several weeks ago. Of the original party, Tolirayth and Vereonwe stood alongside Thangrimm along with their new friends—Jeremiah, Orm and Johann Firehammer. The day was chill, but the sea was calm and so they set sail as the tide turned in their favour. Taneli—a skilled fisherman—made good time across the bay even though Orm had insisted on towing his own boat—an armoured rowboat of unique design—behind the fishing boat in case it was needed. 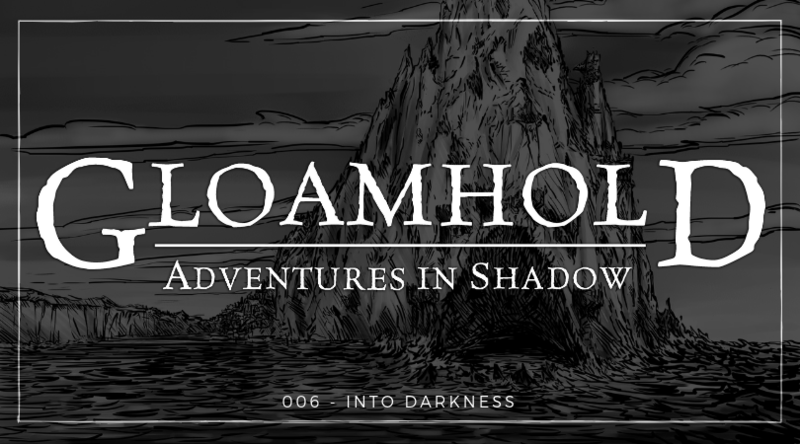 The journey was essentially uneventful, except for when they sailed passed Gloamhold proper. Although Taneli gave the place a wide berth, the party could easily see the sea seething about the jagged rocks warding the entrance to the cavernous tunnel from whence flowed the Murkwater’s dark, chill waters. Alarming, shortly thereafter, the party sailed through an area of flotsam, but of the vessel or what caused it to sink there was no sign. About three hours after they set sail from Languard, the party arrived off Greystone. Taneli had no desire to sail into the cold, stygian waters of the village’s harbour and so once again the party alighted on the village’s breakwater. When they were all ashore the warriors donned their armour and the heroes, nervously clutching their weapons, made their way into the village. About them was desolation. Above them, seabirds wheeled and squawked but—the wary adventurers noticed—no bird dared to hunt in the harbour’s fell waters (for the heroes all remembered something large and dangerous dwelled therein). The adventurers quickly made their way to the ruined church and investigated the ruins. Johann noticed several footprints of bare-footed human-sized individuals among the ruins but could not make out where the footprints led. It seemed they were not alone amid the ruins. Without further ado, the party got to work clearing the rubble from the archway they had discovered several weeks ago. After a half-hour of dirty, hard work a large enough space had been cleared for someone to crawl inside. Thangrimm volunteered and quickly made his way into the sepulchre. He discovered a short flight of steps leading downward to a landing. Dust lay thickly on the ground, and it was clear no-one or nothing had traversed the stairs for many years. As he peered about, Jeremiah joined him. As their fellows, except Tolirayth who kept watch, cleared away the rest of the tumbled masonry the two explored a little further and discovered another set of stairs leading deeper into the tomb and a short side passage ending in a shut wooden door. So great to read recaps again, and I see your previous word challenges have bled into recaps now! Keep them coming and continue to regale us with your tales. Thank you, Cory! I will.